Levon, " I love to look out the window to watch birdies and to snoopervise the neighbours on a clear, sunny day!" Levon, " But there is something I enjoy doing even more on a sunny day!" Levon, " Luxuriating in the sun until I hear breakfast being called!" 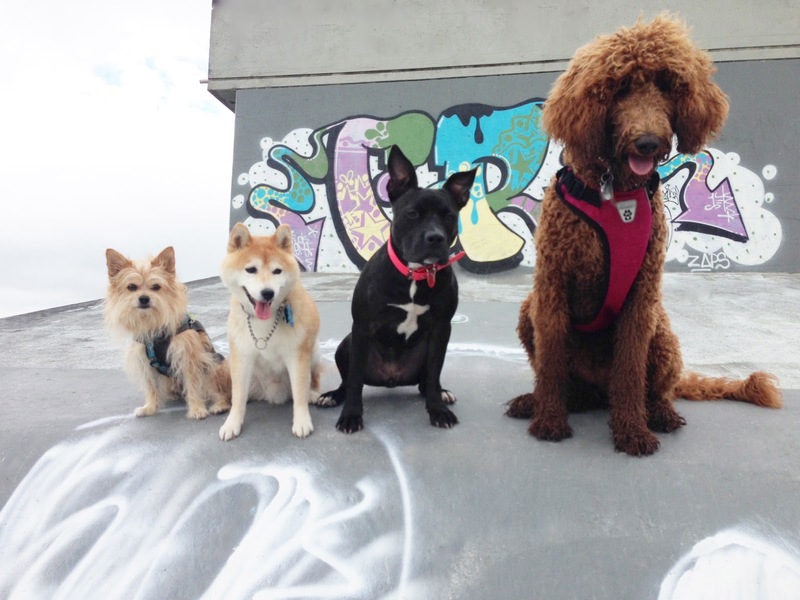 Sunday Selfies : Dogs , cats , and a bird. MITALEE (sun drenched on her cat tree). WILHELMINA ( posing with her branch). DUFFY ( shimmering in the sun). LEVON (hanging out . . . of his basket). DUFFY and WILHELMINA ( having fun in the sun!). DUFFY ( who is feeling much better now). CHEEKY WEST COAST SEAGULL (on the hood of our car). Show and tell with Mitalee. Mitalee, " It has been sunny and beautiful for most of the week here in Vancouver! I have been spending time in my box enjoying the sun. I wanted to show you something!" Mitalee, " Here is a close up of my furs. 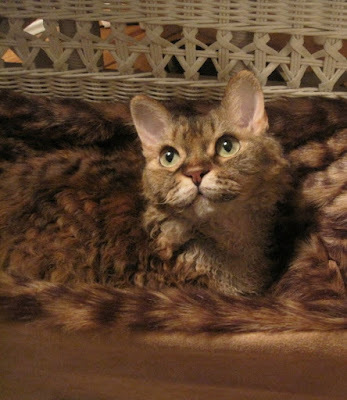 I am a Selkirk Rex cat and we have very few guard hairs also called an outer coat, nor do we have many awn hairs which are thinner than the stiff hairs found throughout the outer coat of a cat. My coat is mostly made up of down fur or underfur and it is very, very soft! " Mitalee, " That's my show and tell for today! I guess I'll go back to napping in the sun now. Enjoy your day kitties and pups. I hope the sun is shining for you too!" Levon, " I am in my cube! I can snoopervise everyone inside this cube!" Levon, " There go the noisy pups running and woofing all about!" Levon, " No one will ever think to find me here, which means I get to bask in the sun's rays undisturbed, for as long as I like!" Wordless Wednesday : Four Friends. Mitalee, " I am sharing my bed because sharing is caring. That is what I often hear the comparably taller people say to the comparably smaller people." Duffy, " I am feeling a bit better but I still have a week's worth of antibiotics to take. LP doesn't particularly like to give me antibiotics but there didn't seem to be an alternative in this case. She mentioned she would give me probiotics when I am done the medication so that my system will stay strong." Duffy, " Everybody has been extra nice to me here at the cottage. It's nice to have sweet furblings checking in on me throughout the day." Mitalee, " Also, Duffy's furs are really fun to play with, especially his tail furs!" Sunday Selfies : Four Cats. 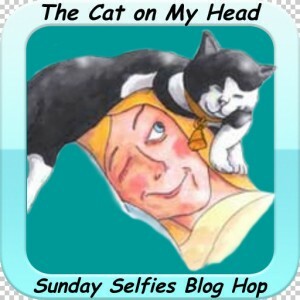 We are joining our sweet friends at , The cat on my head , for their always fun Sunday Selfies! This week the four Cool Cats in the cottage showed up while the lazy pups slept in. We hope you enjoy their efforts! Wilhelmina, " I am at the jetty later in the day than usual. I am watching birds!" Wilhelmina, " Canada geese are flying over me, then landing in the ocean." Wilhelmina, " When the sun started to set, the Canada geese floated toward it, riding the ocean's surface." Wilhelmina, " It was both exciting and peaceful to watch." Mitalee wiil not tell a lie! Mitalee, " I enjoy posing for the camera, I will not tell a lie!" Mitalee, " Click. Click. Click. Look at delectable me!" Mitalee, " And when I've had enough, I simply close my eyes!" Malou's favourite time of the year. Malou, " It's starting to get cool during the night and the radiators are turned on in the evenings. They are nice and warm by the time the morning arrives, just in time for the sun's rays to fall on me! " Malou, " I heat from below, and I heat from on top!" Malou, " It's such a nice feeling!" Malou, " Also, I can look out the window and check for bird activity!" Malou, " This is my favourite time of the year!" P. S. Thank you for all the well wishes for Duffy. He has been quite unwell but seems to slowly be mending. Cat and dog for Duffy. Levon, " I know this looks as though I am doing the, "every bed in the house is a cat bed snafu". But I'm not. I'm actually keeping this spot warm for Duffy on account he is unwell." Levon, " I believe he will be home any moment now." Duffy, " I am sick! I have kennel cough. The vet gave me antibiotics and cough medicine. I am not supposed to go on any adventures for a week or so in order to allow my body to rest and heal. Can you see how unruly my furs are on my side? That is on account LP is carrying me around everywhere outside. I only get let down for my ablutions." Wilhelmina, " I am keeping a close eye on Duffy until he is 100% better!" Wilhelmina keeping a close eye on Duffy! Duffy, " Under Levon's and Wilhelmina's care and watchful eye, I should be better in no time at all!"